Harry is fond of saying that why you barbecue is more important than how and what you barbecue. For many of us who love the thrill of competing, there is another side to the story of how a person’s barbecue journey can be a tale of inspiration and reconciliation. 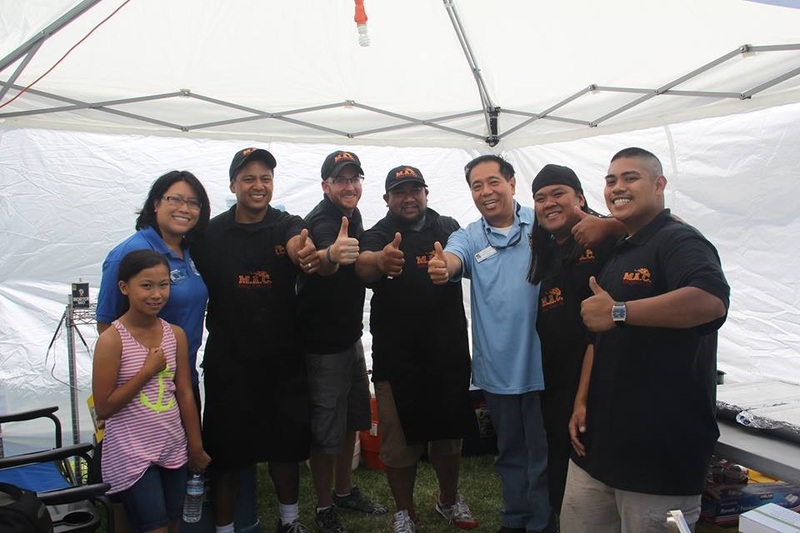 A year ago, Harry and I cooked the pro-division at the 2nd Annual Silicon Valley BBQ Championships in Santa Clara, CA. It was there that we met the three members of the Grillionaires, Chris Cave and Andy Thompson. I remember sweating heavily in 96°F heat wave as Chris and his friends came up to our tents, looking for Harry. He wasn’t there at the time, but I shook all of their hands as we introduced ourselves. Though I was melting, these young men brimmed with optimism and energy. As our hands locked, Chris vigorously shook my right hand up and down. I smiled as we talked BBQ talk for a few minutes, asking them to return when Harry got back. That day, the Grillionaires took the Grand Championship of the Backyard division. Two weeks later, we were in beautiful Santa Rosa at the Wine Country Big Q contest. This contest has a mystery meat category and some of the top cooks in the west coast were there competing. With the extra mystery category and a Safeway Ranchers Reserve category, we were up to our ears with cooking. Harry asked for a few volunteers to help and by some strange coincidence, Chris Cave walked up and became Harry’s helper. Chris was grateful for the opportunity and Harry appreciated the help he gave. So when Harry’s name was called for first place, perfect score in the mystery meat category, the two of them couldn’t believe it. I took a great photo of Harry and Chris that day. It is a day that I never forget. 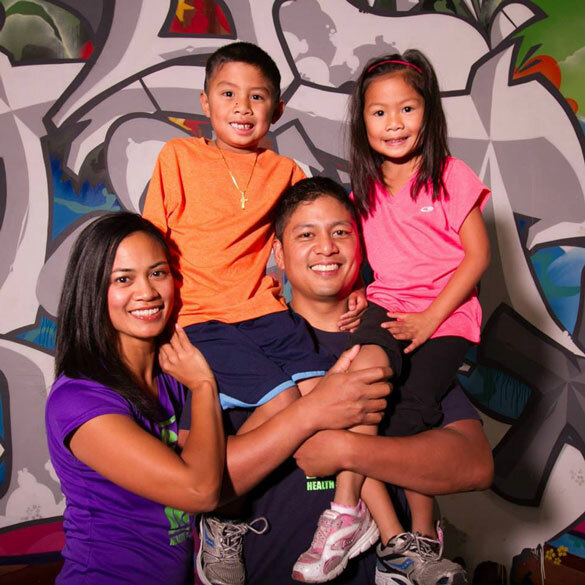 By the end of the year, Chris had decided to form his own pro-division team, took one of Harry’s classes, began raising funds and practicing his cooks. We exchanged emails as he had questions. Chris was well prepared and drew from many resources. 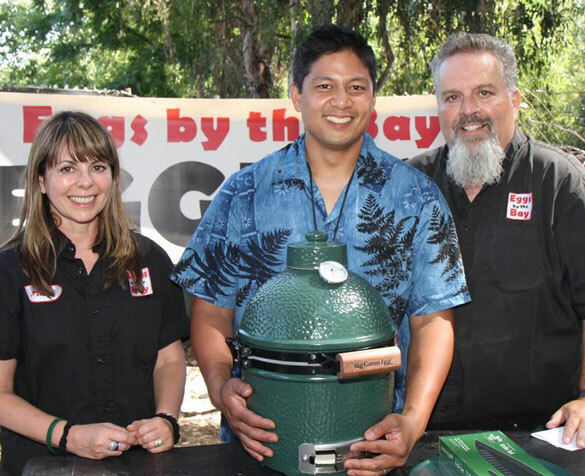 Last month, he and I were supposed to cook as two separate teams at Ric’s Backyard contest in San Jose. But Chris never showed up. I asked why and someone said his mom was sick. Two weeks later, Chris told me that his mother had passed away. He was heartbroken. I didn’t know that it was she that inspired him to cook. It didn’t stop him cooking at EggFest where he and his friends did very well. When he wrote a letter to the two of us about his mother and what happened, we asked permission to publish his journey on Harry’s website. He said yes. One year to the date, at the Silicon contest, Harry and I walked out of the judges tent and straight over to Chris’s site. He still smiled but a little less brightly; the pain was still present. We hugged and talked a little about the cook. Not wanting to touch on sadness, he continued the conversation by introducing his family and many friends. You could tell by the way he introduced each person how important they were to him. Teammates wore customized black T-shirts with the team name, M.A.C. BBQ Shack across the front. There must have been at least six young supporting Chris. They weren’t just the guys who helped him setup, cook and cleanup. This group was his anchor and support. Having read what he had gone through, it reminded me of my own father-in-law’s death and how much that changed my attitude with life. Everybody becomes more important in your life because you’ll never know when you’ll lose them: or when they will lose you. You just never know. Thank you Chris for sharing your inspiring story about your mother, Carmelita Cave, who lived a good life from January 4, 1951 to May 30, 2014. Chris’s teammates are Andy Thompson, John Valenton, Jonathan Ancheta, & Marco Perucho. His wife is Mary Ann and his kids are CJ (son) & Kenzie (daughter). Don’t mind sharing more details. Sharing is part of my coping process. Plus, I got blessings from my Dad and sister, Norma, to share details. My mom passed away due to a brain aneurysm. Unfortunately, the bleeding occurred around the brain stem and the area of the brain that controls involuntary movement such as cough reflex, gag reflex, pupils dilating. Wednesday, May 28th, my dad picked a beautiful vegetable from the garden and wanted to show it to my mom. He hollered out for my mom to go check it out. She did not respond. He walked into their bedroom and found her lying down on the floor nonresponsive. He called for an ambulance and packed up a change of clothes assuming she was going to be an outpatient. Later that evening, my dad called me and passed the phone to the neurosurgeon. Doc simply said, “Chris, your mom is in really, really poor condition. Safely come over as soon as you can, okay?” Instantly, I was sad. Arrived to the hospital, saw the doc and he essentially told me that the damage was so devastating that there was no chance of a meaningful recovery. The only involuntary reflex that was functioning at that time was her cough reflex. I asked the cause. He said it is very likely from hypertension. My mom had high blood pressure. It’s not like she didn’t try to manage it. She took medication, ate better, and exercised. As you can see from the pictures she lost a ton of weight as she got older. She made efforts to be a healthier her. It was just her time to pass on. I requested for her to continually be on life support until my sister arrived from Philadelphia. Unfortunately, the first voicemail Norma heard when she arrived in the Philly airport from her flight back from the Caribbean islands was from me about my mom. She booked a flight and arrived in SFO by noon on Thursday. On Thursday night, there was a moment when it was finally just my Dad, Norma, my Mom, & I in the room. No one else. As soon as it was just us, my Mom actually showed signs of life, she was breathing over the ventilator, her pulse was looking normal, and I was fortunate enough to be holding her left hand when I felt her squeeze my hand twice. It almost felt like her spirit jumped back in her body just to show us that when we get together she comes to life. The nurse walked in and told us that my Mom was “feeling us” and that we’ve gotten her excited. She asked us to calm down to not excite her too much. My mom’s breathing only lasted another minute. On Friday morning, May 30th, the neurosurgeon told us that she has no neuro-activity. In his words, “she has passed the gates”. That night we disconnected the life support. I’m glad to see Sisters from Different Misters winning RGC at Ric’s. I wish my team could have been there. Unfortunately, my mom passed onto paradise the day before Ric’s Warm-up. So, I dropped everything and focused on being with my family. The night before Eggfest, Smitty hosted a meet and greet. I arrived and Smitty greeted me and gave me condolences. Class act. Immediately, I felt that cooking at Eggfest was the right move. On the morning of the Eggfest I found it difficult to focus. Emotions were out of control and to be honest it still is. I was prepared to cook from an XL Egg and totally forgot that Smitty would have 2 Large Eggs provided for me instead. I took deep breathes and found the positives in things to get me through. Somehow I was able to obtain the proper tools to bake apple pies from 2 Large Eggs. Smitty positioned my cooking space between Mark and John. My wife and kids arrived. Compliments, condolences, & love were being exchanged. I definitely felt being in Eggfest was the right move. It was great therapy. To top it all off, Mark won 1st place People’s Choice award with his Island Style Ribs out of 25 registered chefs. John made a very positive impression with his NY steak sandwiches. I won 3rd place with pulled pork over garlic rice and Mary Ann’s apple pie a la mode. Quite a fulfilling day not because of the accomplishments but because I felt like I shared my love and passion for the BBQ lifestyle with my family. Mom would have approved. More good stuff… My team achieved our kickstarter goal and are fully funded for this year’s bbq competition registration costs. And we had a tasting for our kickstarter backers this past weekend and received positive feedback. So, now onto the next challenge, Silicon Valley BBQ Championships. Before the passing of my mom, I had a lofty goal in mind, for my team to finish in the top 10 in one meat category. Now, our goals are simplified and much more realistic; to turn in all meats, to not finish dead last, to learn, to expand our bbq family, and have lots of fun! 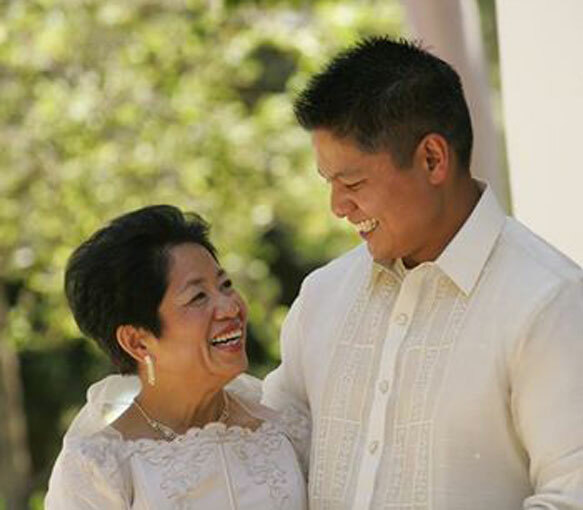 This year, I dedicate my rookie year to my Mom. She only had two rules. To be a good man and to be happy. I’m definitely abiding by those rules by sharing my love for bbq to everyone. If you and Harry have a spare moment, please look for our site after you’re done judging. I hope to introduce you to my family and friends. We’d love to take pictures with you if you don’t mind. Thanks for sharing, my love for cooking came from my mom as well. For the last four years I have not competed, spending that time spreading the gospel of BBQ through catering and special events. I’m going to have to check my schedule and see if I can’t sneak in a contest or two. Thanks again for sharing, I know our Moms are in heaven cheering us on. Anthony: you’re right! Our moms are definitely cheering us on! Good smok’n luck to you!! Thanks for sharing that wonderful and inspiring story! You’ve described Chris very well, Smitty. He has said many times how important mentors are to his journey and I’m glad you are definitely a mentor to so many. Go Chris!